I work with the poor. I love working in rural areas where people are simple and usually poor. I am from Iowa, a state that doesn’t really even have a city. The closest places we have to “cities” are Des Moines and Cedar Rapids, but compared to Chicago, Kansas City or Minneapolis they are only small dots on the map. 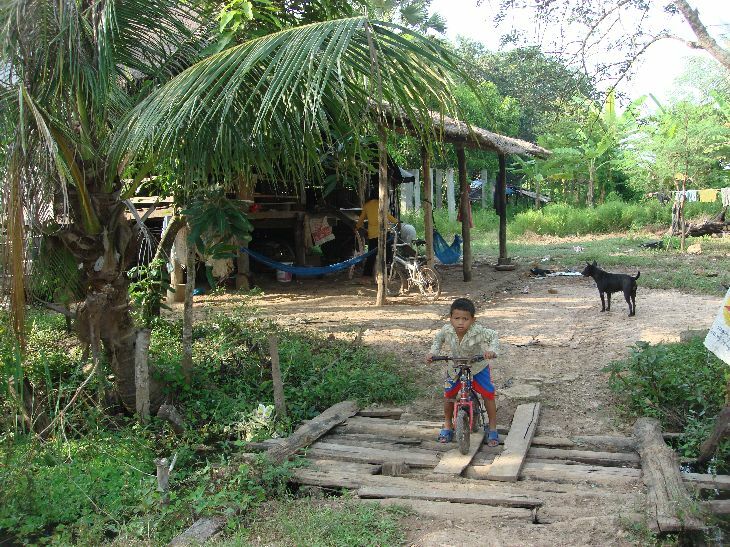 In Cambodia, more than 80% of the population live in rural areas. I know that most people tease rural people for being simple, ordinary and naively friendly. They work hard and are often underappreciated and under paid for their efforts, in nearly every country on earth. The cities, urban areas, on the other hand see themselves as the future and the center of wealth, politics and power. They are characterized by their own genius, building, and aggressive nature. Their unspoken motto is to be first, be best, and run over anyone that gets in your way. What about when famine comes to a land? Modern terminology calls this “food shortages”, “drought” and “global warming.” It is part of the natural cycle of life in any part of the world. The urban food security plans are going to go by the way of their financial security plans! They can disappear in an instant! Have you ever tried to eat money? Trust me, it is not very nutritional! The rural people, however, always have something to eat. In rural areas they have land, good land, they are used to surviving by their own efforts, growing abilities and divine provision. They also know how to live off the land. They will not starve. One day, you will need them. Genesis chapter 47, as highlighted by a Singaporean friend (urbanite) of mine named Ivy, is a fantastic study of why the rich need the poor. There was a drought in the land of Egypt. God had told Joseph about it before it happened, so he stocked the storehouses so that his people would survive. He was friends with the poor. He was friends with the rural farmers. When the great need came, everyone, especially other urbanites, had to come to him to beg to buy his food. First he took all their money, then he took all their livestock, then he took all their lands. Egypt became a great and powerful nation for generations because he was friends with the poor. The Bible records, “20 So Joseph bought all the land in Egypt for Pharaoh. The Egyptians, one and all, sold their fields, because the famine was too severe for them. The land became Pharaoh’s, 21 and Joseph reduced the people to servitude,﻿ from one end of Egypt to the other. 22 However, he did not buy the land of the priests, because they received a regular allotment from Pharaoh and had food enough from the allotment Pharaoh gave them. That is why they did not sell their land. 23 Joseph said to the people, “Now that I have bought you and your land today for Pharaoh, here is seed for you so you can plant the ground. 24 But when the crop comes in, give a fifth of it to Pharaoh. The other four-fifths you may keep as seed for the fields and as food for yourselves and your households and your children” (Genesis 47: 20-24). You may not notice what is so interesting about this verse. Yes, Joseph bought all the land of the people. He had resources. Do you have resources? I would imagine so. Enough to buy land? Probably. But notice what Joseph did. He bought the land, but he did not remove the people from the land. He left the people on the land. Do you think they liked Joseph? No, they loved him. He saved them out of their poverty and in their time of dire need. He did take over their land, but he didn’t remove them from their land. They continued to produce on their land. It is an interesting business model. The urbanites bought the land, but they didn’t remove people from the land. They allowed, and even requested the people to continue to work the land. (Urbanites don’t know how, nor would want to grow their own food.) Joseph supplied them with the seed and they repaid out of the harvest of the land (one fifth) to the landlord. They kept 80% for their own continued profit, food and continued production from the land. The rural people continue to benefit and yield the fruit of their labor. The urban people can get the food that they need. One more point, actually a law of God: Year of Jubilee. Every fifty years the land is returned to the original owner. In the next generation. The moral of the story is not to go and buy land, but to be friends with the poor. In time of need, you need them and they need you.